After finishing school, Jane took a degree in Psychology and then worked as a social worker and later a counsellor with children and young people. When her children were small Jane enrolled on a City & Guilds Embroidery course, then continued this line of study on the Stitched Textiles Diploma at East Berkshire college. From this, she went on to complete an Applied Arts degree at the University of Hatfield. Following that, Jane and 3 other artists formed the textile group Material Space. They continue to meet up and exhibit. Jane’s work includes large and small scale pieces, installations, 3D work using a variety of media including cloth and stitch, paper, bark, and metal. 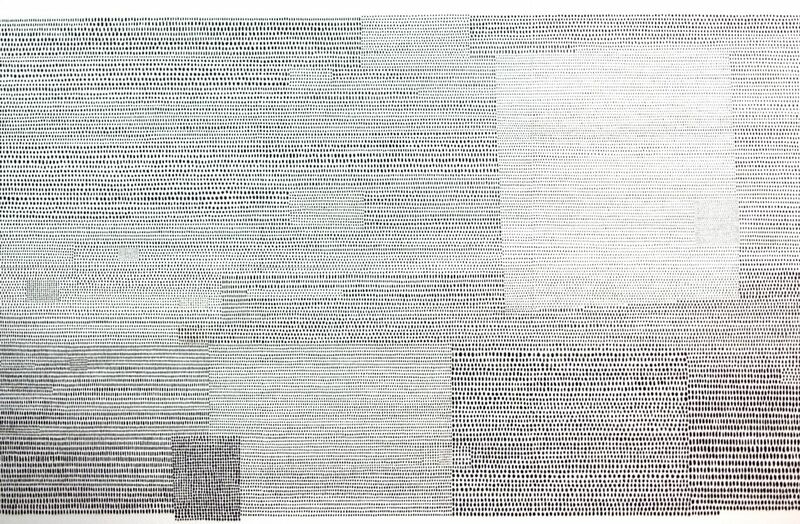 Jane Neal: Inspiration comes from mark making and the particular quality of a mark or repetition of marks, research from books, the work of other artists, found, natural, objects and the specific features of certain materials, for example, the tactile nature of a fabric, paper, bark, etc. My work usually begins with a concept or idea which frequently has some link with human relationships or methods of communicating. Over the years a train of thought will develop and change, but often still links back in my mind to an initial idea. I spend a great deal of time reading and researching my ideas then experiment with materials and marks to find the best way to convey them. My work is usually abstract and I use tactile and visual qualities to engage the viewer. I also like to create large-scale immersive pieces where the viewer can interact with the piece spatially giving their experience another dimension. Currently, I’m living in Greece and am inspired by the land around me, the ancient and more recent history and the current political and social climate. I am also trying to learn to read and speak Greek, which links back to my interest in human communication and the development of languages. The artists discussed here have inspired me in countless ways over many years. There are common threads which run through all of their work and which link with aspects of my own work, the importance of the natural environment and the use of natural materials, human engagement with the natural environment and with each other, paring things down to represent ideas in their simplest form, dimensional work which allows the viewer to interact with the piece, links with ancient history and man’s developing communication since the beginning of time, mark making, texture and communicating ideas in an abstract way. The aspects of Richard Long’s work which first attracted me were his interest in making marks in different ways, his use of natural materials and the importance of the land itself. He invites the viewer to look again at the environment around us and think about how we can actively engage with it, making our own marks and being marked by it in the humblest of ways, by simply walking. In making his own marks, whether by walking, moving stones or creating sculptures and ‘paintings’ out of the natural materials around him, he creates links in our imaginations to the land, to human history within the natural environment and to our ancient ancestors who left their mark in similar ways. In making his own marks, whether by walking, moving stones or creating sculptures and paintings out of the natural materials around him, he creates links in our imaginations to the land, to human history within the natural environment and to our ancient ancestors who left their mark in similar ways. I especially like the simplicity of Long’s work which reveals the beauty of the materials he uses. His work pares everything down to its most simple form, exploring the materials and shapes often using repetitive gestures and marks, each one unique. In addition to his physical works of art and photographs, Long’s text works demonstrate astute observation and the ability to condense places and experiences down to the bare minimum, whilst also conveying meaning and giving the viewer a strong sense of his experience in a place and time. As someone who enjoys walking and has always had a keen interest in natural history, Long has helped me become more observant of the natural environment around me and more appreciative of the marks and patterns to be found within it. In my work, I have tried to create simple abstract pieces which open up the viewer’s imagination and allow them to make their own interpretations. What initially drew me to the work of Sue Lawty was the subtlety of the muted colours she used and the understated nature of her pieces. I was swept away by the delicate beauty of her weavings. As someone who has always loved and been inspired by old textiles, their designs, faded colours and fragility, I was interested to discover that Sue Lawty was similarly influenced by such artifacts. Later on, at the Victoria and Albert Museum’s Concealed, Discovered, Revealed exhibition of her Artist in Residence work, I was fascinated by the suspended coral fragments. I have always liked artwork which the viewer can walk around and see from all perspectives and I especially liked the fact that you could see through the coral to other exhibits, allowing you to focus on the work itself or look through it at other works. At a time when my work was based on relationships and connections between people, I made an installation for my Diploma exhibition which encouraged the viewer to walk inside the piece and, through being translucent, make their own connections within and outside the piece. As an avid collector of all sorts of found objects, usually natural, from my journeys near home and farther afield, I particularly loved the stone patterns and assemblages, their tactile nature and the way their marks seem to have mysterious links with language in some form. Much of my own work has focused on touch, tactility, and communication and in my Touch, Separation and Loss pieces I used an abstract pattern to try to convey some of these ideas. My main memory of seeing the work of Polly Binns is at the Surfacing exhibition at the James Hockey Gallery in Farnham in 2004. The predominant sensation when walking through the rooms was one of wonder and awe at the scale of the works and their contemplative nature which was almost mesmerizing with the restrained colour changes and delicate use of thread as mark. The large scale of many of the pieces, or smaller pieces assembled into wall-sized works, gave the feeling of an expansiveness which almost took your breath away, then the eye was drawn into the minutiae of the many repetitive marks, each of which was slightly different from all the others. The pieces worked beautifully from a distance as an overall impression in their apparent simplicity and also close up, because of the detail of the stitch and subtlety of the colour changes. The impact of the scale of the pieces inspired me to create large pieces and think about using stitch or thread more as an abstract mark creating visual detail. My work has often involved, or originated from, mark making and using abstract marks to represent or convey ideas. 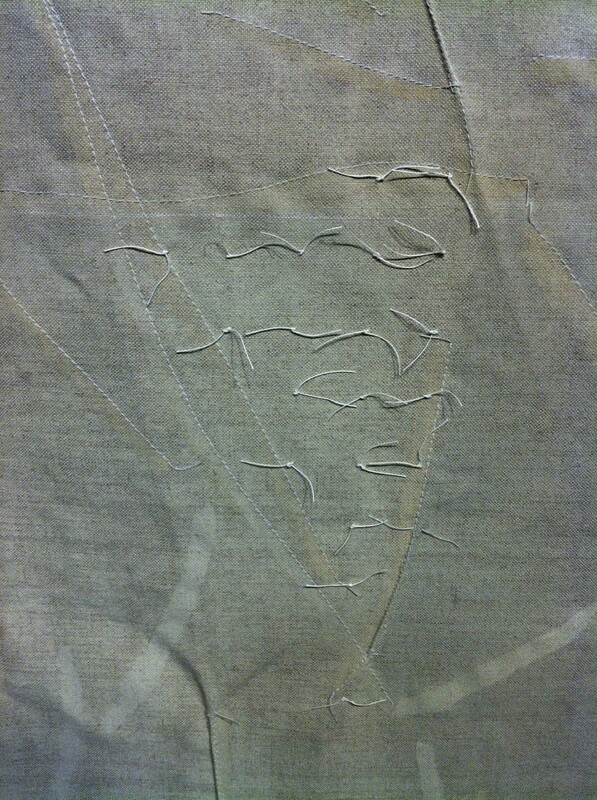 The distinctive nature of the marks made in Polly Binns’ works made me think about the delicacy and beauty of each individual stitch or thread, the ways in which different types of thread behave and the unique mark they create. My Written on the skin and Lost languages pieces have used some of these ideas to convey the written word. I have been drawn to the art of Anselm Kiefer for many years and never miss the opportunity to visit exhibitions of his work in London where I live. Although I do not like every piece of work, I always find them thought provoking and am usually astonished at the breadth and scale of the pieces. I was initially fascinated by the dimensional textural surfaces he created and his use of a variety of natural and other materials, such as clay, shellac, straw, plants and lead. Marveling at the dried, cracked mud sculpted onto the canvas and the muted colours which were applied, I loved the way that Kiefer created layers of texture as well as layers of ideas and meaning. The materials he uses are full of reference to his subject matter and convey his ideas as well as having an emotional effect on the viewer. In my work, the materials I have used have been chosen to enhance the meaning and express some of the ideas in both a visual and tactile or textural way. I have hoped that they would allow the viewer to engage with the piece on an emotional level too. Kiefer is interested in history, mythology and knowledge gained from books. His gigantic lead books in which photographs, images and text are layered to create mysterious and magical pages which, although not necessarily decipherable, look like ancient texts recently excavated. I love to read and have an interest in the development of language and writing, especially ancient forms of writing and symbols, along with our attempts to decipher ancient texts, many of which are still unknown to us. Antony Gormley’s universal human forms encourage us all to imagine what it is to be human, in relation to our environment and to each other. His simplification of the human figure provides an empty canvas for our imagination. I love the fact that the viewer is able to enter the space of the sculptures and to become part of them, bringing their own ideas and experience into play with Gormley’s. He allows us to directly experience his fascination with space, internal and external, whilst also giving us permission to think about how we are affected in and by different situations. I admire the way he has continued to explore similar concepts, using the same basic form, constantly developing his own ideas in many different ways, using a variety of materials and spaces to convey his thoughts. Standing on the beach at Crosby one bleak, cold northern day amidst Another Place elicited in me feelings of isolation, the desire to travel, wonder at what each of the figures might/could be thinking and also imagining that the figures were somehow guardians and protectors of the shore. No doubt the other people there with me had entirely different thoughts and feelings inspired by the figures. In a society which constantly tells us what to think, what we should or shouldn’t do, Antony Gormley’s art provides us with space and room in which new thoughts and ways of seeing and thinking can come into being, he encourages us to wonder. In choosing these five artists, I was not only reflecting on specific artworks, but also the artists’ practices. As I wrote, I realised that there are many similarities between all of these artists’ practices, despite their diverse fields: the use of repetition; commitment to a material, process, or form; use of simplicity, and allowing space for viewer interpretation. These are all qualities which I believe underpin my own practice, and consequently I have been left asking: have I absorbed these qualities from the artists I have admired, or have I been drawn to these qualities in others which exist in myself?